•A furnace works to keep a home warm in the winter and plays a critical part in the operation of an air conditioning system. •Furnaces produce heat through the combustion of natural gas in the furnace's burner. The heat produced from this process then passes through a heat exchanger. Air from your home's return air ducts is blown over the heat exchanger, thus warming the air. •The furnace's blower then blows the warmed air into the ductwork, which carries and disperses the warmed air throughout the home. •During warmer months, the blower inside a furnace continues to circulate return air throughout the home--only this time, the return air has been cooled by being blown over the indoor coil portion of the home's split-system air conditioning system. The condensing coil is typically installed on top of the furnace. •Indoor warmth any time it is required. •Energy efficiency. The efficiency of a furnace can be determined by its AFUE--or Annual Fuel Utilization Efficiency. The minimum efficiency level for furnaces currently manufactured in the U.S. is 80% AFUE. A rating of "80% AFUE" means that for every dollar you spend heating your home; 80 cents are actually applied to the generation of warmth. Compared to many of the 60% AFUE furnaces in older homes, 80% AFUE furnaces are a significant improvement. However, for enhanced energy efficiency, you may wish to consider a 95+% AFUE furnace, such as Amana's line of 96% AFUE Furnaces. •Cleaner air. 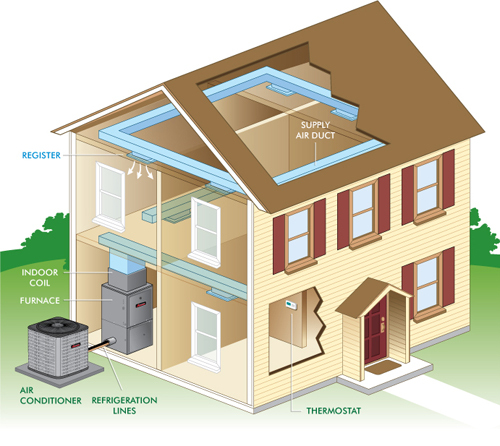 As your HVAC system draws air out of various rooms in the house through return air ducts, the air is pulled through an air filter, which removes airborne particles such as dust and lint. Sophisticated filters may remove microscopic pollutants, as well. The filtered air is then routed to air supply ductwork that carries it back to rooms. Whenever the HVAC system is running, this cycle repeats continually, constantly filtering and cleaning the air in your home. •This cleaning process improves with the installation of a variable-speed furnace. Variable-speed furnaces use variable-speed blowers, which shift between several speeds. These furnaces will run longer at a low speed, which causes them to filter the indoor air more frequently. •And remember. Because the furnace plays an important role in the operation of the air conditioner, its variable-speed blower helps maintain both a consistent indoor temperature and improved air quality year-round. •Possible Tax Credit As part of the Energy Policy Act of 2005, the U.S. government has made a provision for tax credits of up to $200 for homeowners who install furnaces with an efficiency of 95% or greater between Jan. 1, 2006, and Dec. 31, 2007. Consumers should discuss these tax credits with a tax professional to see if they qualify.